Organisers of the Manchester Beer and Cider Festival are working with the Society for the Preservation of Beers from the Wood (SPBW) to bring the bar – simply named ‘Beers from the Wood’ – and a host of interesting beers from a wide variety of breweries both large & small are heading to the event – led by SPBW’s current Champion Beer From The Wood ‘Hickey The Rake’ from Newcastle based Wylam Brewery. The Society For The Preservation of Beers From The Wood was founded in 1963, 8 years before CAMRA, when the festival venue – Manchester Central – was still a working rail station. Together with CAMRA, they have over one hundred years experience of promoting traditional real ale. Stainless steel and aluminium casks overtook the use of oak as they were quick and easy to produce and can withstand mishandling. Gradually breweries dispensed with their in-house coopers who crafted and repaired wooden casks and very few are employed now. 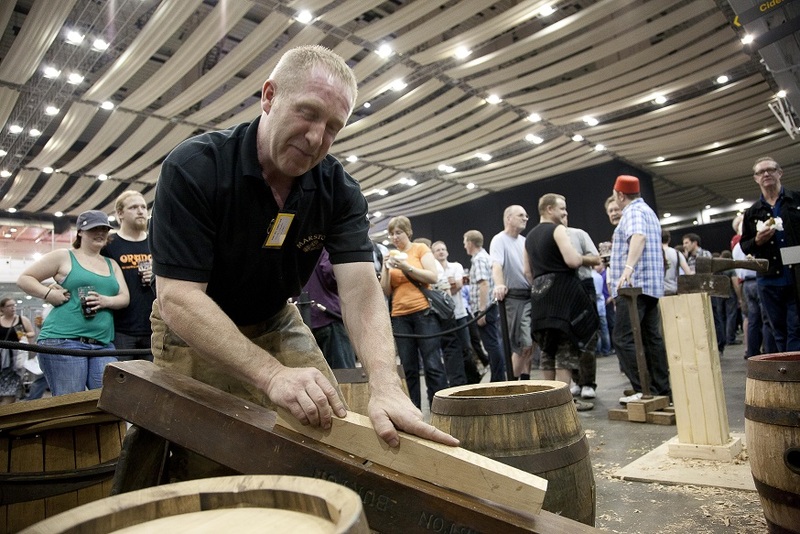 There is only one privately-run cooperage in the UK. Many wooden barrels now appear in less glamorous guises as tables, planters and even bins. However, some brewers such as Theakston of Masham have kept the wood tradition going through the decades. As the new generation of brewers started researching older recipes and discovering the complex favours that can be gained from storing beer in wood, interest in serving beer from the containers has been renewed too. Brewers in regions such as Yorkshire have maintained the traditions more than others – Wakefiled based Ossett group will have no fewer than six beers from the wood from all five of the breweries in their stable on the bar – including two from the most modern, Salt Beer Factory, which only opened in October. He went on “We should have around 50 beers being served from wooden casks with some of the country’s finest breweries represented – the three beers from Wylam will be exceptional plus we’ll have Elland’s 1872 Porter, a former Champion Beer of Britain from the wood. Manchester’s own Blackjack Beers have teamed up with Sheffield’s barrel ageing specialists Abbeydale to produce a special white stout for the bar while Brass Castle brewery have put the former MBCF Beer Of The Festival Bad Kitty into Bourbon casks for us”. There’ll also be a chance to taste beers from the wood while listening to an expert. Roger Protz is probably Britain’s best known beer writer, and he’ll be running a tutored tasting on the Friday afternoon of the festival. ← Crumbs! Beer expert really takes the biscuit!